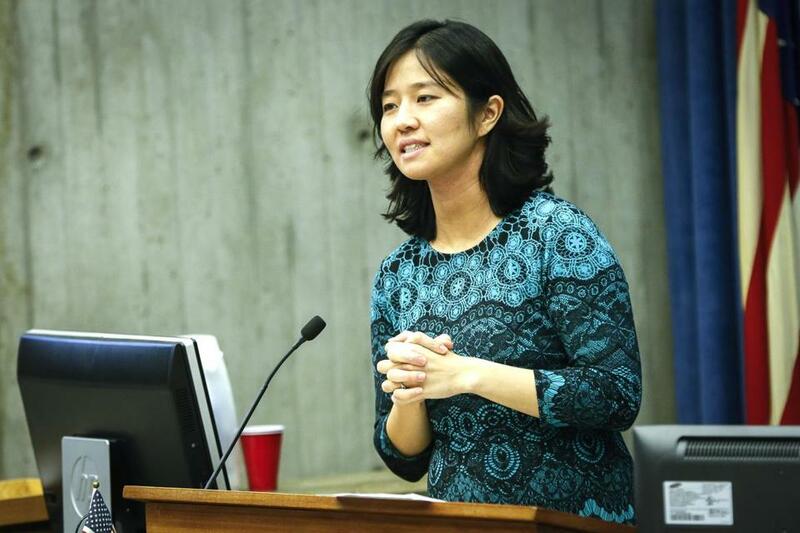 City Councilor Michelle Wu drafted an ordinance to regulate lobbying in City Hall — substituting a proposal Mayor Walsh submitted two years ago. After a relatively cozy first few years with Mayor Martin J. Walsh, the City Council lately has been going its own way — and, in many cases, to the mayor’s left. In a series of recent votes and hearings, city councilors have increasingly taken their own course to change or challenge policies, often putting them at odds with Walsh and creating friction between the two branches that hasn’t been seen in years, said veteran City Hall watchers. Historically, councilors haven’t had much authority — or exercised it — under city government laws, which were amended as recently as the early 1950s to give the mayor strong executive powers. But this session’s councilors — a historically diverse group representing the city’s broadening progressive political landscape and emboldened to take action amid the uncertainties of Washington, D.C., politics — seem more willing to challenge the Walsh administration and exercise what powers they do have. “It’s a more progressive council; it’s a council that is going to flex its muscle a bit more perhaps than we’ve seen in the past,” said Sam Tyler, the longtime head of the Boston Municipal Research Bureau, adding that he has not seen such a collective movement in decades. It’s not any one individual rogue councilor: It’s several councilors putting forward their agendas, he said. The latest divergence came last week, when the council passed a local ordinance to regulate lobbying in City Hall — substituting a proposal Walsh submitted two years ago with his own promise of good government, with its own plan. City Councilor Michelle Wu, who drafted the new proposal, said the council is simply exercising the powers it does have to pass laws, and quickly. “It’s less about who’s on the other side of the decision. It’s more about what we’re aiming for, and how we can get it done with the urgency it deserves,” said Wu, who has also challenged Walsh on other policy issues, such as the purchase of green energy. The council has also gone its own way on key policy reforms such as a ban on single-use plastic bags, restrictions for short-term rentals, and adding lobbyist registration rules, while councilors continue to be at odds with the mayor on issues such as the purchase of green energy, and curbside compost collection. The council’s proposals have often gone farther left than even Walsh, a union leader before he was elected mayor, has attempted to go. In Walsh’s first term in office, he and the council had a relatively amicable relationship, sharing the same vision on public policy issues. The first year was rocky, with disputes over politically sensitive topics such as pay raises, residency requirements and the city budget. But by the time the mayor stood for reelection, he had several allies among the council, and his only consistent critic, at least publicly, was then-councilor Tito Jackson, who was running against him. That changed quickly following the fall election, which Walsh won with 66 percent of the vote. Only weeks later, the council resurrected and then passed the ban on single-use plastic bags — over Walsh’s threats of a veto. That ban goes into effect at the end of this year, and a lead sponsor, Councilor Matt O’Malley, has already chided the administration for a lack of progress. O’Malley denied that the council has had an antagonistic relationship with the mayor, but he agreed that more councilors — and the newer ones as well — have been pushing forward their own policy agendas. For him, that has meant focusing on environmental issues. The council also went on its own in shaping the controversial regulations of short-term rentals, reigning in a fast-growing industry that has been run through popular websites such as Airbnb. While the council initially pushed Walsh to submit his own proposal for short-term rentals in January, councilors then pushed Walsh to agree to strengthen the proposal, for instance by agreeing to eliminate an investor class in the law. In between, the council has held hearings that have put pressure on the Walsh administration, ranging from an inquiry into the Police Department’s use of potentially civil-rights-infringing technologies like drones, to the monitoring of the planting of trees in various neighborhoods. The newfound charge among councilors comes amid a historic remake of the council: Six of them are women of color, a first. They include Ayanna Pressley, the first black woman elected to the council, and Wu, the first woman of color elected its president. City Council President Andrea Campbell said that each councilor has his or her own policy initiatives that they want to carry out, and in quicker ways. Campbell, for instance, has initiated a series of hearings examining gender and ethnicity diversity in law enforcement, a topic that has discussed for years, but one she said is due for change. She pointed to similar efforts by councilors to examine teacher diversity, and close achievement gaps in schools. She recently called for the council to have a stronger say in the budget process. And she and other councilors have increasingly opposed a home rule petition process that requires the city to seek state support when it wants to enact laws with certain provisions such as hefty fines. Councilors have argued that they should go alone, and pass whatever laws ordinances they can. That’s what happened with the lobbying reform package that was approved Wednesday. The council agreed to seek state support for Walsh’s proposal, which calls for fines of up to $10,000 for lobbyists who do not comply. But councilors, saying they have no faith of its success in the home rule petition process, also passed a law that can go into effect immediately, without the level of punishment Walsh proposed but also without the need for state support.